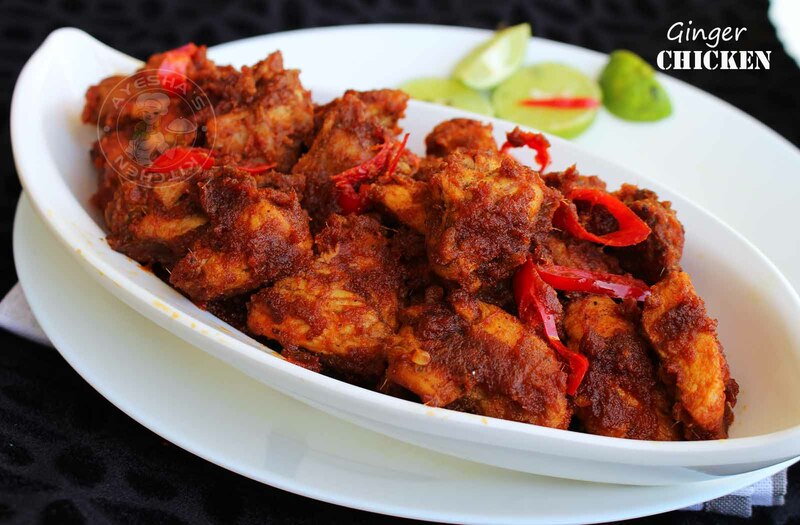 Ginger chicken - one of the most popular chicken dish with an extra ginger punch that adds a finger licking taste and aroma to the entire dish. We are very familiar with the medicinal properties of ginger. As ginger has been used as an effective digestive aid, the use of ginger in this chicken dish makes the dish more digestible. You will be familiar with Chinese ginger chicken, ginger chicken gravy, Stir-fried ginger chicken, Ginger chicken Indian etc. Today am back with yet another yummy spicy juicy chicken dish. That is Ginger chicken recipe dry in Indian style. Indian food especially chicken recipes are irresistible with its aromatic spices, hot chilies, ginger garlic paste etc. Like so, the ginger chicken recipe for dinner or for lunch along with butter naan or chapati will surely cheer you up. The taste of ginger dominates the whole chicken dish. Apart from that, it is the less mess chicken recipe with few ingredients. Though it sounds simple it is really interesting and finger licking good. Thanks to my blog friend Aarati (yummy tummy) for sharing such a wonderful dish. So here is the recipe showing how to make ginger chicken dry/yummy chicken dish / easy chicken recipes / Indian chicken recipes. Marinate the chicken chunks (i used bone-in chicken ) with soy sauce, pepper powder, and vinegar. No need of adding salt as soy sauce itself will be salty. Let it set aside for half an hour. Heat butter in a non-stick pan (2 tbsp melted ). Add marinated chicken chunks and toss them over a high flame and then reduce the flame. Again over a high flame until chicken is golden and half done. When done, transfer it to a plate. Set aside. Grind together onion, ginger and garlic in a blender. Make a fine puree. Now in the same pan add more butter if required. Saute ground paste over a medium flame. Saute continuously and cook until the oil floats on the top (very important ). Now add chili powder, chopped red chilies(or green chilies) and tomato sauce. Mix well. Cook well and add a dash of water if required. Add salt. Then add the tossed chicken pieces. Mix well. Now cover and cook for 15 minutes or until chicken is fully cooked and well coated in the gravy. When you reach the right consistency, you can see oil separates from the chicken gravy. Switch off the heat and garnish with coriander leaves chopped and chopped chilies. 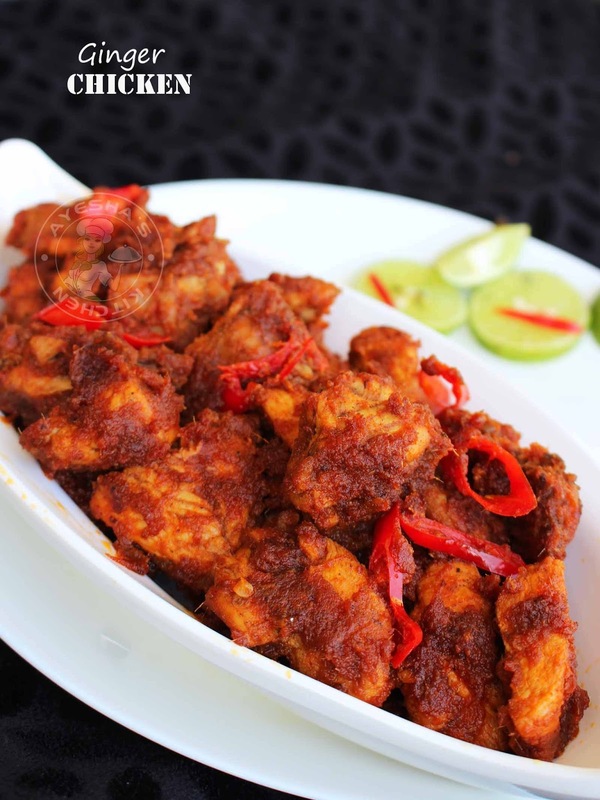 Yummy flavorful ginger chicken is ready to serve. It is finger licking good chicken dish and I recommend to try this at least once.